Camden Montague has unique one, two and three bedroom apartments that will fit any lifestyle. Situated in the perfect location in the Tampa Bay Area in Hillsborough County and bordering Pinellas County this community is just right for you. It is located minutes away from the Veteran’s Expressway, Tampa International Airport, Clearwater and area beaches, downtown business districts, International Plaza, Westshore Plaza, Citrus Park, and Countryside Malls. Our Tampa Bay apartments feature spacious walk-in closets, soothing soaking tubs, brushed nickel fixtures, ceiling fans, and a full-size washer and dryer. The gourmet kitchens include stainless steel appliances, microwaves, and 42-inch tall dark wood cabinets. Some apartments have beautiful screened in patios so you are able to enjoy the gorgeous Florida weather while relaxing just outside of your apartment. 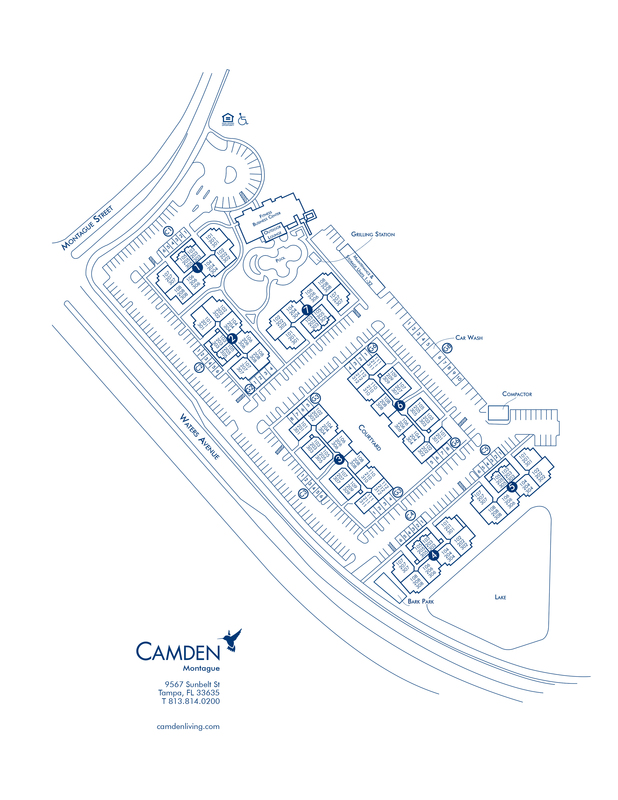 Whichever floor plan you choose, you will love living at Camden Montague. Everyday conveniences are right around the corner like Target Super Center, Winn Dixie grocery store, Walgreens and Michael’s. Excellent local foodie restaurants, coffee shops, watering holes, and entertainment are also within a few miles. THe onsite fitness center is a perfect fit for anyone who loves to work out. With high endurance cardio and weight training equipment, it is the place to be! If you love to exercise outside, the Upper Tampa Bay Trail is located just steps away from the community. It is a 7.25-mile wide trail where you can walk, bike, run or rollerblade. It is perfect for anyone who loves to be outdoors. Camden Montague is the perfect place to relax and unwind. Grill your dinner on the outdoor gas grill and hang under our covered lounge next to the tranquil pool. You can also play billiards with your friends and watch the big game on one of our many TVs in the resident lounge. Whether you work from home or just need a quiet place with fast WiFi, the business center is the place to be. Connected to the leasing center, the business center is complete with a multi-function printer, desktops and comfortable seating. Watch TV and surf the net at home with today’s best technology from Frontier FIOS ‘Double Play’ Package with 180 + Channels, High-Speed Internet, WiFi and much more! Come home to Camden Montague, where living excellence is guaranteed. Bonus! No deposit required with approved credit! Some restrictions may apply. Call today to make an appointment and see for yourself! At Camden, your pets are family too! We welcome cats and dogs, up to 3 pets per apartment home with no weight restrictions. Call us with any pet-related questions and come visit our dog park! Pet Rent: $20 per month per pet. Get the perfect spot! We have ample open parking for our residents on a first-come, first-served basis. Garages are available for you to rent too! Single garages are $125 per month and tandem garages are $150 per month. Carports are available for $45 per month. And, bike storage is available for $10 per month. All residents must have a valid parking sticker and all visitors must park in designated visitor spots or park outside the gate by the front office.